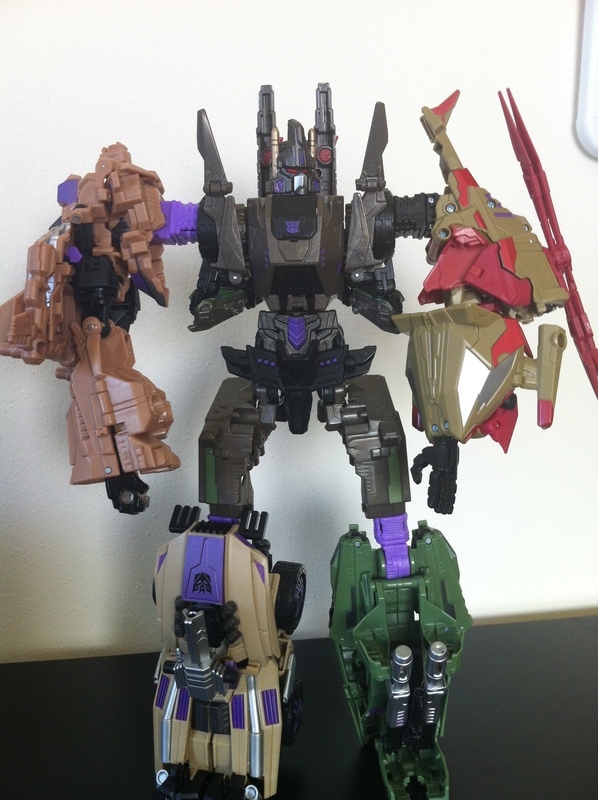 Well its been a fun week – this set has been a lot of fun to review and now we come to the final phase – Bruticus himself! 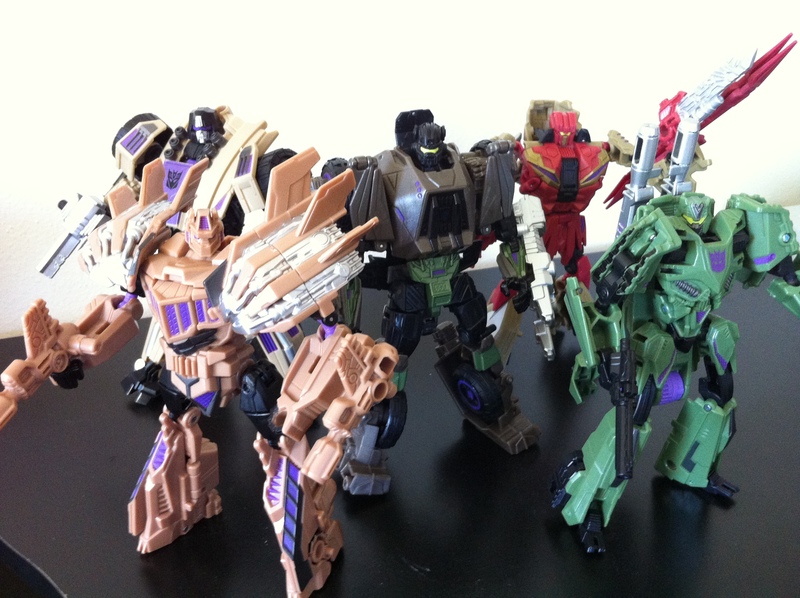 But first – lets get a group shot of the gang! 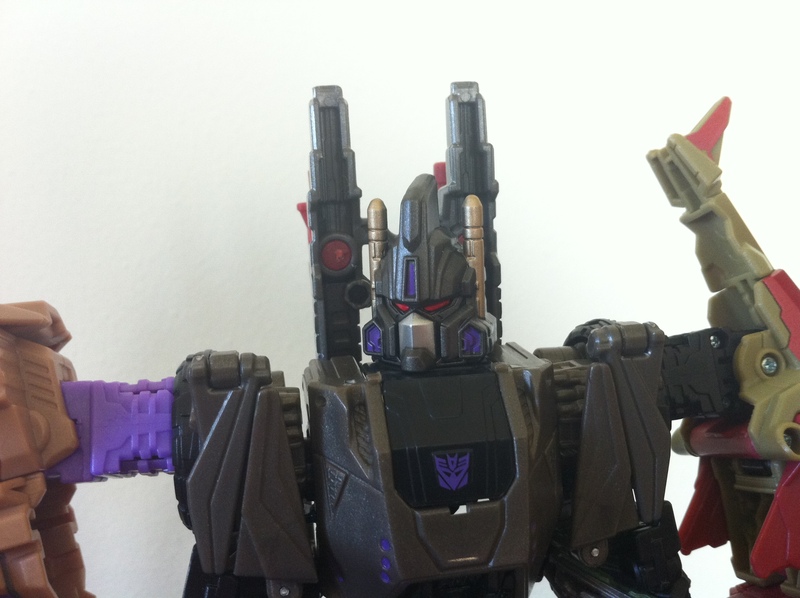 Bruticus online, ready for action! I showed how the alternate transformation for Blast Off works, but for Vortex, I basically just keep from pulling the extendable joint out. It evens out the arm lengths a lot. 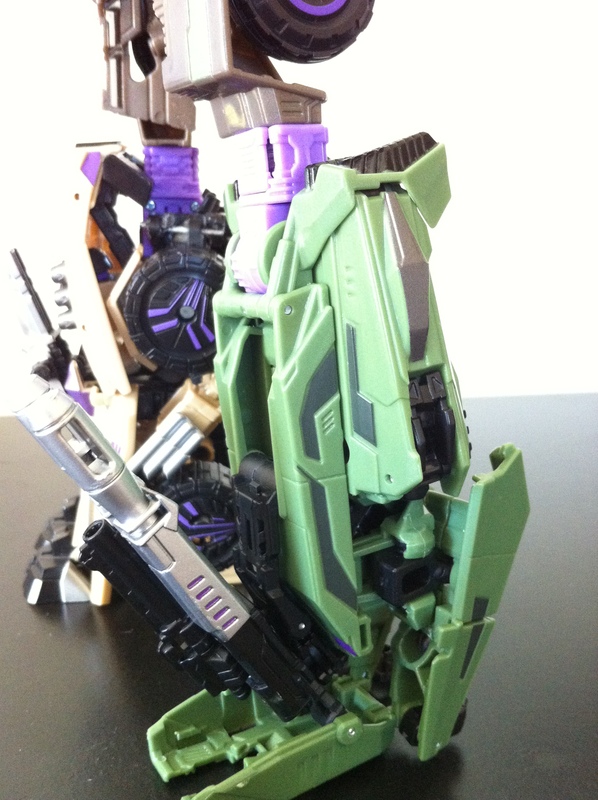 Articulation wise, the arms are somewhat limited, but you can still get some pretty good positions. Winding up for the P.o.K.e. 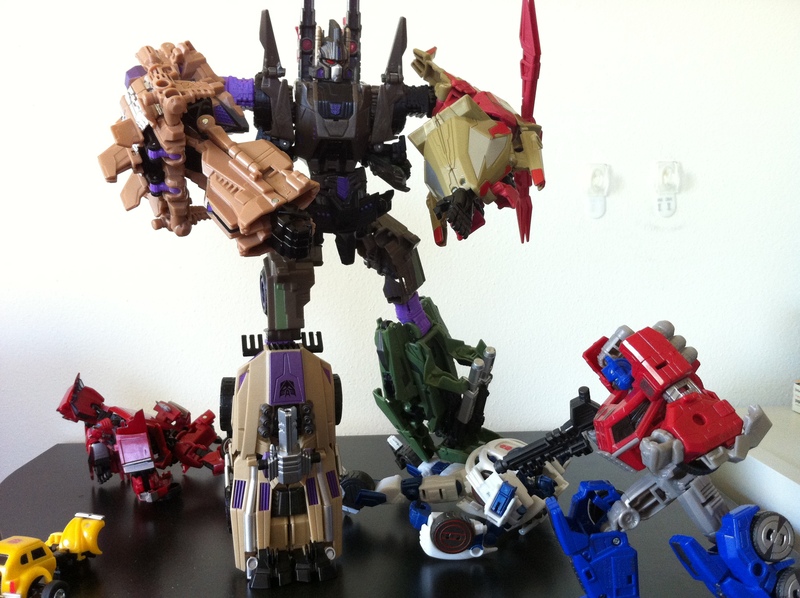 Unfortunately, because of Onslaught’s knee, I’m still a bit skittish about moving the legs around. Kinda freaks me out. I’m not sure how I feel about the “shoulder wings” – I know they should be up, but they seem to look better down. 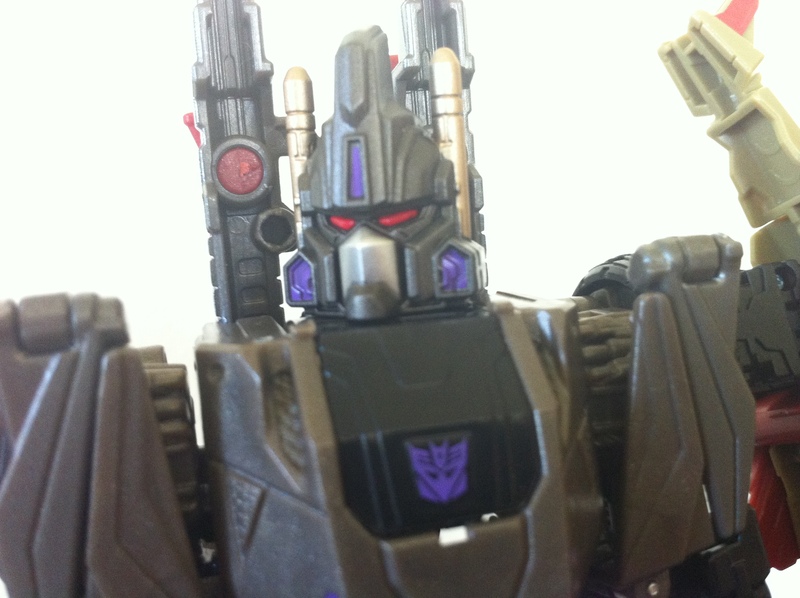 I do have to say, Bruticus’ head sculpt is amazing! 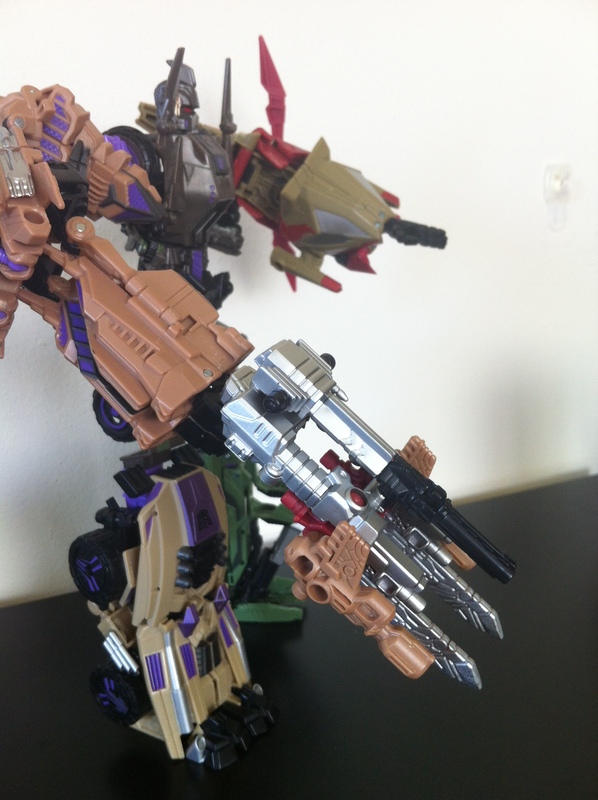 I’ll shoot you with this…um….thing. 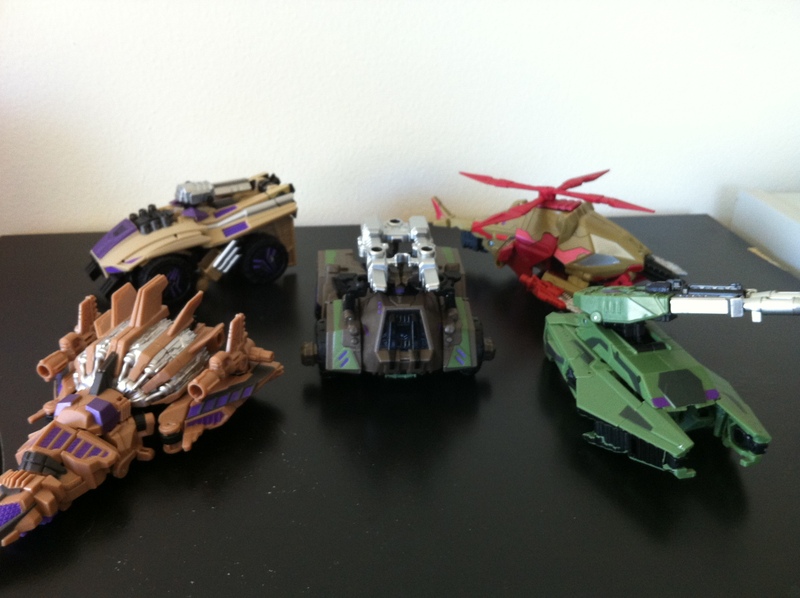 Besides, Bruticus should really have the two cannons on his back. Lol setting up this shot my wife walked in and thought I was literally just playing with them, lol. So there we go! Over all, I just love these guys. I’m really looking forward to the other three sets! 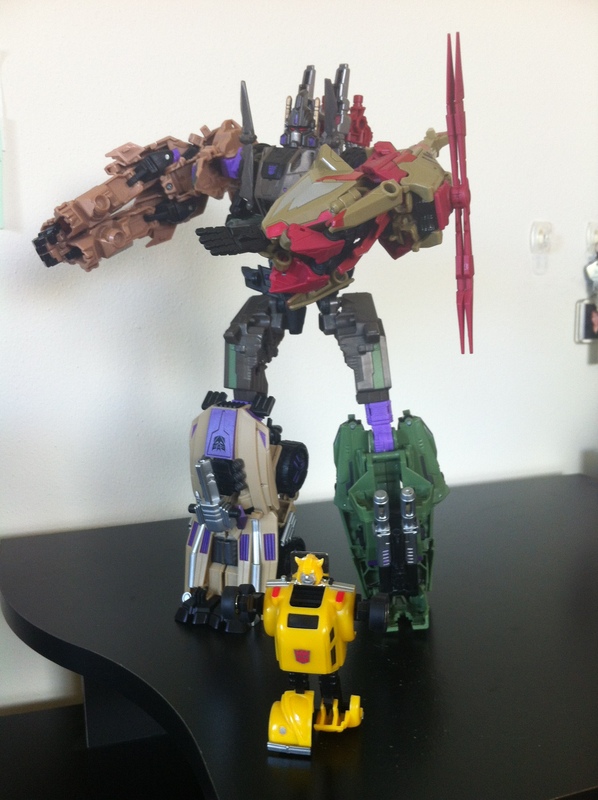 Here’s a final shot – taking his place on the shelf. 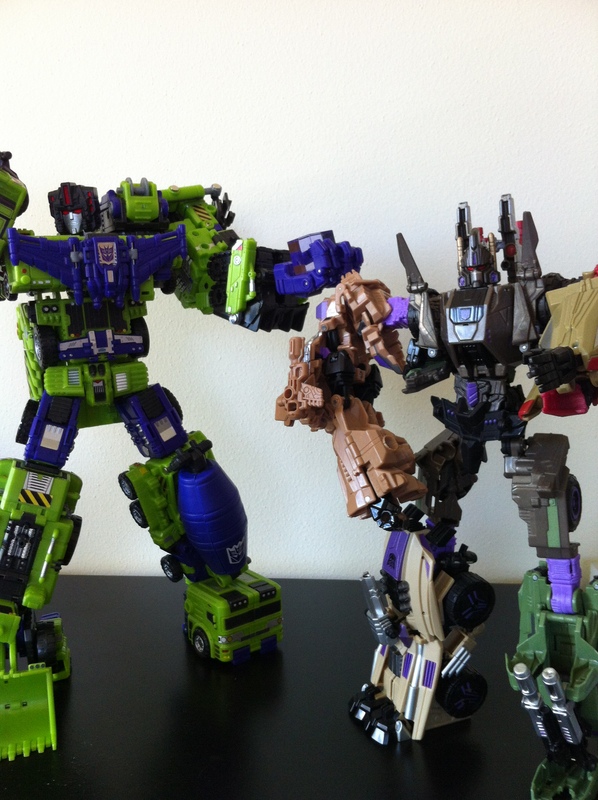 I’ve got the TFC Upgrade coming in this week for Devastator. 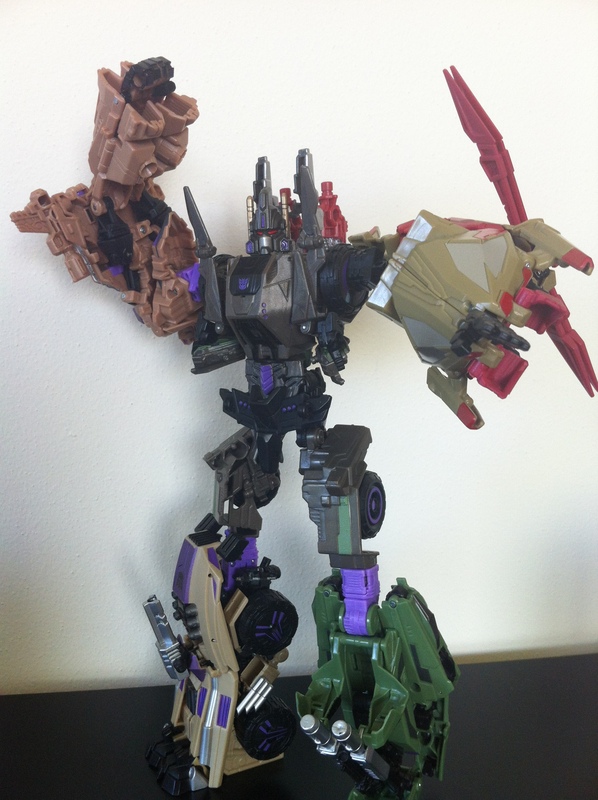 I never really posted on him, but I might as well keep the “combiner” theme going for another few days. Waiting on some other stuff, mostly pre-orders. 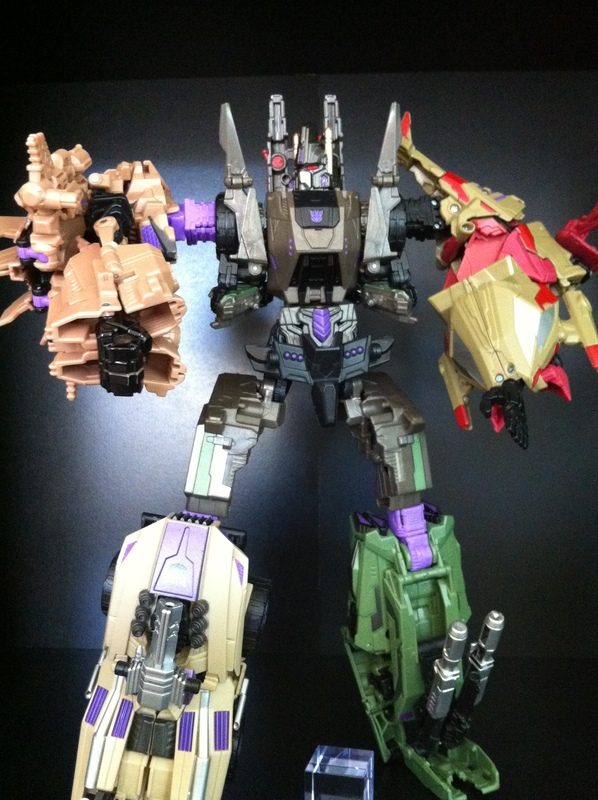 Great review of the entire Bruticus set! I am picking him up for sure. Great engineering. 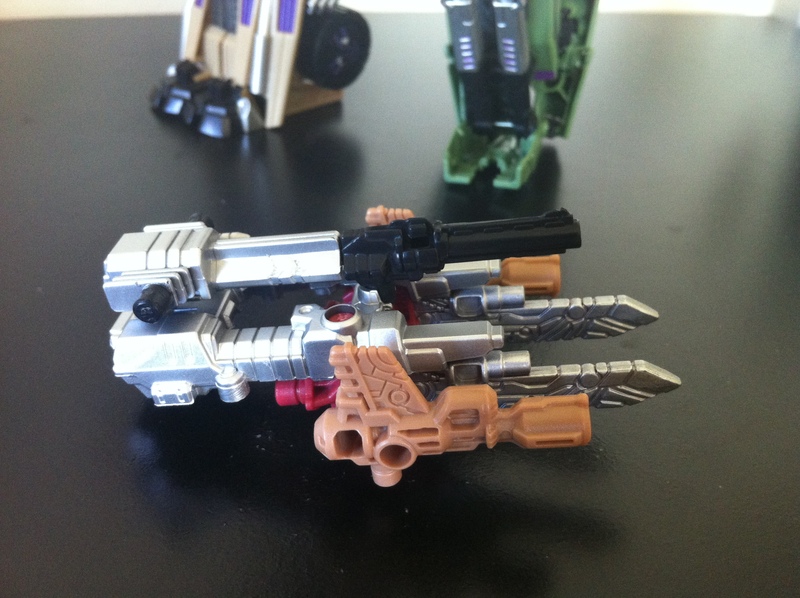 Were you able to figure out a flame thrower mode for blast off’s arm? Hey, thanks! I managed to pick up a Tripod for my iPhone so future pictures will be better, once I get a small photo studio set up in my office. FRICK! I forgot about that! I’ll have to post an update – I sorta did…its not great but it’s not horrible either. Thanks for the reminder! Excellent, that’s what I did, I’ll post on it with some basic ‘step by step’ pictures too. Thanks Scott!